Dreamed of using a jetpack? Now’s your chance! 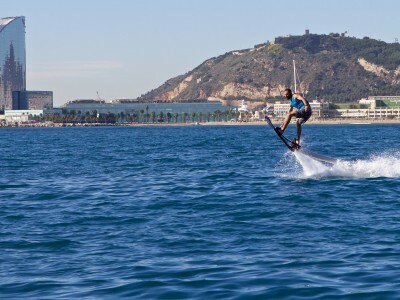 You Can Fly (…With a Hoverboard)! Always dreamed of flying majestically through the air? 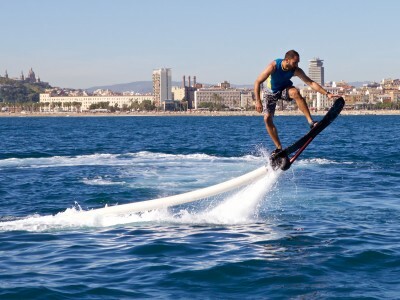 Why not try the newest, most-extreme water sport on your stag do in Barcelona? 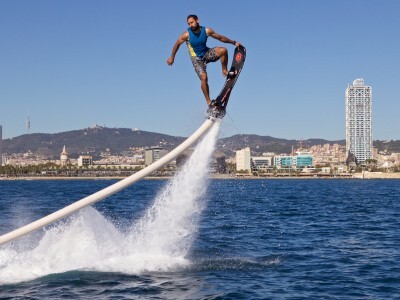 These incredible hoverboards are sure to blow you and your mates away – literally! 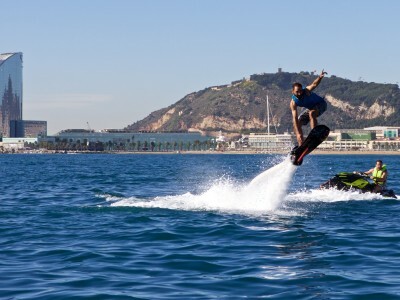 The hoverboards are propelled by powerful jets of water, and enable the brave surfer to fly up to 5 meters above the water at blazing speeds of up to 25 miles per hour! The flying sensation is like nothing else and with no restriction on group sizes, you can compete to pull off the smoothest tricks! 15 minutes not enough for you? Get in touch with us and we can organise some extra time at an additional cost, in increments of 15 minutes. All insurance and equipment costs are included in the price, and you will have a safety talk and instructor with you. You just need to focus on the fun, and remember to bring along everything you need for some time in the water too! To participate in this activity, you must know how to swim. Up to 16 friends can come along to watch your group from the boat for a small additional fee.